Why do I go deaf when I yawn? Part of the show Why do we have pubic hair? When I yawn, for a brief moment, I can hear nothing of the outside world. Its feels like my ears were stuffed with some best earplugs. Do you have this feelings too? If yes, could you enlighten me what is going on here? Thanks. Chris - The reason is that the way that you hear stuff is that the ear canal, which is the bit that you can put your finger into in your ear, ends in a structure called the eardrum, and the eardrum is a sheet of tissue which, when vibrations in air, which is what sound is - its mechanical vibrations, those vibrations impact on the eardrum, they make it vibrate and those vibrations are then conducted through three tiny bones into your inner ear, which is also known as your cochlea, and that is where soundwaves effectively become brainwaves and your brain then decodes what those vibrations meant, and that's how we interpret the sound world that we live in. Now the problem is that the middle ear, which is where those three tiny bones are, is connected to the back of your throat through a structure called the eustachian tube. And you need that because when the outside pressure changes, if there was no way for the pressure on the inside to be equalised with the pressure on the outside, then, if say you went up a mountain, you'd have lots of pressure inside your your head and no pressure outside and your eardrum would bulge painfully outwards. If you go diving and you had no way to equalise, the pressure of the water would push painfully in on your eardrums. And some people who go diving and do find they get pressure in their ears, that's exactly what's happening. 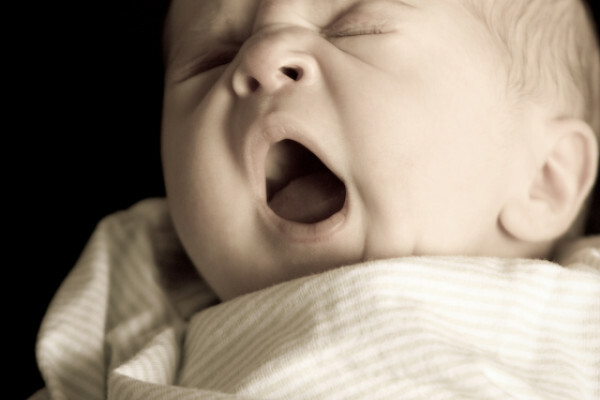 But when you yawn, you're applying a lot of pressure inside which is conducted down your eustachian tube and pushed outward on your eardrum and it changes the ability mechanically of the eardrum to respond to those vibrations in the air. It affects its stiffness, which means that the hearing is shifted out of the regime of most of the frequencies that we interpret as sort of speech and meaningful sounds. Your ear becomes much less capable of responding to those sounds, those frequencies when you've got that high pressure in your ear, and that's why you experience this momentary deafness while you're in the middle of a yawn. Previous Why are my rubber bands losing their spring? Next How did male and female first evolve? Why does spicy food make me hiccup?